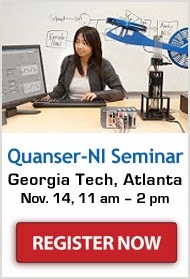 On Thursday, November 14, Quanser and NI bring their unique platform for controls education and research to Georgia Tech. cover the entire academic usage spectrum: from undergraduate teaching labs for introductory control through to advanced courses and graduate courses, and ultimately to a broad range of research application. Collectively, the companies' pooled portfolio of products is emerging as a more efficient and effective option over the traditional multi-vendor platforms. This seminar will provide concrete information, case studies, and demonstrations on how such an integrated approach to control systems can improve research and teaching. 11:00 AM - Harmonizing the disconnect: the vision and goals of the Quanser-NI platform. 11:30 AM - The development process for a complex UAV application focusing on the new NI myRIO embedded platform. 12:30 PM - Accelerating controller design and prototyping in LabVIEW for principal areas of control research and education. Register for the seminar today!